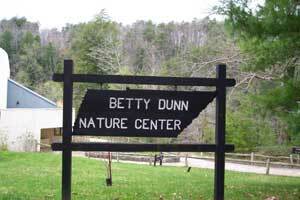 The Betty Dunn Nature Center located in Fall Creek Falls State Park was dedicated to the First Lady of Tennessee by Tennessee House Resolution No. 328 in February 1974, for her tireless energy, creativeness, and talent towards developing the Nature Center into a facility. Today the Betty Dunn Nature Center includes a small interpretive center and a bookstore. The interpretive center provides information on the region’s geologic history, vegetation, ecology, wildlife and cultural history. The bookstore contains resource books for all ages on various natural and cultural resources in Tennessee, especially those on the Cumberland Plateau.